Maine-Wabanaki REACH's Truth and Reconciliation Commission opened the chance to speak and listen to true stories as a way toward honesty and healing. 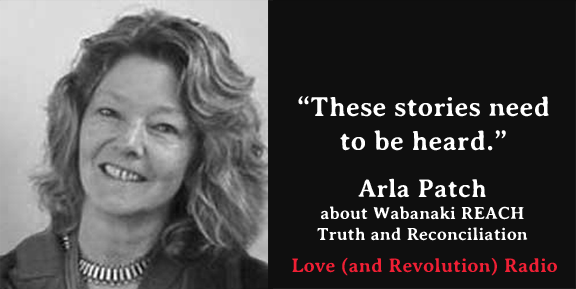 This week on Love (and Revolution) Radio, we speak with Arla Patch about the groundbreaking work of the Maine Wabanaki State Truth and Reconciliation Commission that sought to speak truth about the legacy of genocide, trauma, racism, and abuse both historically and in the context of the mistreatment of Wabanaki children in the state of Maine foster care system. Arla Patch is an artist and educator who uses art as a tool for healing. She began working as a volunteer for the Maine Wabanaki State Child Welfare Truth and Reconciliation Commission and later became the Community Engagement Coordinator for Wabanaki REACH. She currently lives in Pennsylvania, and is a member of the Quaker Society of Friends, serving on the Peace and Social Concerns Committee and also the Native Awareness Committee. Stay tuned for what's coming next on Love (and Revolution) Radio. Sherri Mitchell and Rivera Sun are headed to northwest Wisconsin for a gathering of women from all walks of life and several countries. During this retreat, we'll be sharing stories, discussing change, and gathering strength for transforming our world. While we're up at Echo Valley Farm with Dena Eakles et al, we'll record a special message to the world from some of the women who have gathered. Who's Dena Eakles? Check out our radio interview with this visionary woman. Sherri Mitchell (Penobscot) is an Indigenous rights attorney, writer and activist who melds traditional life-way teachings into spirit-based movements. Looking for essays, writings, tweets and posts from Sherri Mitchell? Follow her at Sherri Mitchell â€“ Wenaâ€™gamuâ€™gwasit https://www.facebook.com/sacredinstructions/ or via the social media links below. Copyright Â© 2016 Love (and Revolution) Radio, All rights reserved.